It has taken me nearly 5 years to perfect the herbs, numbers, saints, colours, gemstones, and scents I use for these oils. A lot of research went into this oil and I believe it to be far superior than any other Orisha oils you will find. 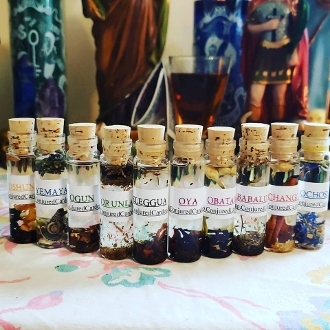 Information can be collected about these Orisha, but I experimented and tested each correspondence so I know they work! You will receive all 7 oils in this set, 1/2 ounce each, in a charming glass vial with natural cork. Some practitioners include Oya, Ochosi and Babalu Aye, which are included in this set. Ogun (Ogoun, St George) is the chief of the warriors, the God of War, blood, and iron. He is the guardian of the forge, and the patron of civilization and technology. Not just a martial deity, Ogun is the archetypal force that drives technology. He is responsible for tools of progress like farming implements and surgeon’s knives. He is movement, impetus, force. Because of this, Ogun is associated with locomotives, and offerings are often made to him at railroad tracks. In Candomble, he is associated with St. George, the dragon slayer; in Lukumi, he is associated with St. peter. Because of his association with blood, Ogun is often petitioned for aid with blood diseases. However, because Ogun enjoys blood offerings, it is considered inadvisable to petition Ogun while menstruating or with a bleeding wound. Oil contains musk, frankincense, crushed nutmeg . Orunla's favorite animals and objects include kola nuts, palm nuts, and crocodiles. His power object is the ifa board, which is a percussion instrument used in ceremony. A whisk of horse hair is also used to drive away evil. Offerings to Orunla should include yams and black chickens. sandalwood, musk, neroli.